A fairly crispy and light crunch. The difference between thick Chips and thin is stark. And these were no different. They smashed and crashed, rather than cracked and crunched. These Chips were a sort of flat shape in the main. There was not too much oil bubbling and although there was some browning the coloring was a fairly regular, pale yellowy white. There was seasoning visible, but not nearly as much as on the image on the front of the packet. What is it with Potato Chips manufacturers and the word 'Zesty'? These were not piquant or even remotely pungent. 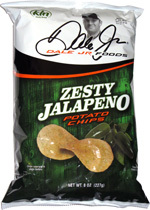 They did however have a spicy kick to them, which is the very least you would expect from a Jalapeno Chip. They also had a fairly good character - they were significantly dissimilar in flavoring to most Jalapeno Chips to be a Zapp's flavor. There was a sort of creamy onion, but salty pepper taste.